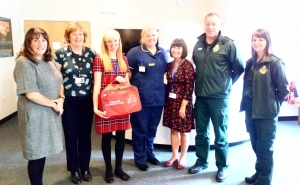 A new ‘Red Bag’ scheme has launched in Bury to ensure care home residents receive quick, personalised and effective treatment should they be admitted to hospital in an emergency. The scheme, which launches this month, will see care homes for the elderly in Bury provide their residents with a Red Bag. The Red Bag contains a patient passport holding important information about the individual’s health, medication and personal decisions. It also has space to store personal belongings such as glasses, slippers, hearing aids and dentures – items which are often easily lost during an emergency admission – along with room for clothes to come home in after their hospital stay. When someone is admitted to hospital in an emergency, the Red Bag, which is already packed and ready to go, is handed to the ambulance crew and travels with the patient to hospital where it is then then handed to hospital staff. By having important information in one place, health staff are able to make informed decisions and avoid unnecessary delays. It’s a simple idea that is centred around the individual. It also helps to improve communication between care homes, the ambulance service and hospital staff, ensuring their assessment, treatment and discharge is timely, which improves their overall experience and ensures they get to go home as soon as possible. When the patient is ready to go home, the patient passport is updated with relevant information reducing the chance of a readmission to hospital. 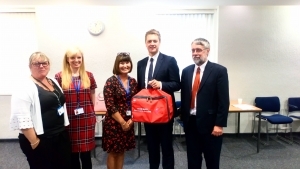 NHS Bury Clinical Commissioning Group (CCG) has been working in collaboration with Bury Council, Fairfield General Hospital (part of Pennine Acute Hospitals NHS Trust) and the North West Ambulance Service to launch the Red Bag Scheme in Bury. A launch to mark the roll out of the Red Bags was attended by all partner organisations and the implementation team (pictured above). Stuart North Chief Officer (now retired) of Bury CCG and MP for Bury North James Frith came along to hear all about the new innovative scheme and offer their support (picture to the right). Picture 1 – Representatives from the partner organisations who collaborated to develop the Red Bag Scheme. L-R: Margaret Lowe (Owner, Bank House Care Home Bury), Lesley Molloy (Provider Relationship Lead, Bury Council), Lorraine Weatherall (Clinical Safety Lead, NHS Bury CCG), Louise Palmer (Assistant Director of Nursing for Emergency and Urgent Care, Fairfield General Hospital), Clare Holder (Designated Nurse Adult Safeguarding, NHS Bury CCG), Mike Hynes Sector Manager (Greater Manchester Area North West Ambulance Service NHS Trust) and North West Ambulance Service NHS Trust colleague. Picture 2 – MP for Bury North James Frith attended the launch event and offered his support for the scheme. L-R: Janine Dyson (Lead Nurse, Care Home Sector, Greater Manchester Health and Social Care Partnership), Lorraine Weatherall (Clinical Safety Lead, NHS Bury CCG), Clare Holder (Designated Nurse Adult Safeguarding, NHS Bury CCG), James Frith MP for Bury North and Stuart North (now retired Chief Officer, NHS Bury CCG).